-An ornamental structure whose creation reflects a whimsical inclination on the part of the builder. -A site intended to capture and preserve the soulful and melancholy beauty of ruins. -In France, a site designed for clandestine romantic relationships. 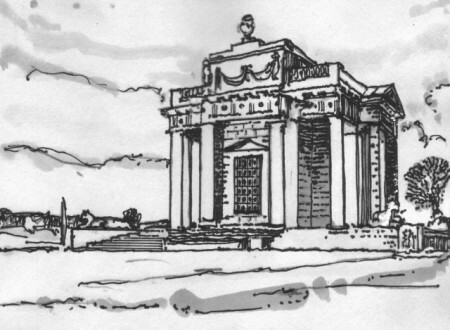 -In America, a deliberate attempt to preserve the universal symbol of democracy of ancient Greece and Rome through recreated temple forms; often seen on banks and government buildings. You are here: >> The Folly of Communication > Uncategorized > What is a Folly?